In which Crichton receives a summons from the alien called Jack, and attempts to prevent wormhole technology from falling into the wrong hands. Do you all remember a time before the mid-season cliffhanger? This episode, I believe, came at a point in time just before these cliffhangers became an actual break in the season, forcing fans to sit on their hands for three months while the next episode percolated. The second episode in this two-parter came a mere week later, but the second part of next seasons mid-season two-part extravaganza came a solid four months later, and “Let’s Kill Hitler” airs this week after a mere yet interminable two month hiatus. Jack sets a beacon buzzing to attract Crichton’s attention. When he arrives, Jack pops into his head to show off a few home movies of a Farscape Module surfing down a wormhole with two peculiarities: A non-Crichton pilot, and a stabilizing device that permits safe transit. Harvey interrupts, pulling Crichton into the bumper cars at Coney Island. He reminds Crichton of someone else who has both plans for the Module and wormhole data. This episode introduces us to Charrids. Truly hideous humanoids, and I’m not just talking about their faces. These guys are the Orcs to the Scarrans Uruk-hai. Fierce fighters, great bodyguards, decent pilots, and eaters of Hynerian infants. Rygel goes on for a bit about a Charrid invasion into Hynerian space for a bit, about the billions that died in their genocidal attack and the millions of suicide bombers that eventually repelled it. He gets a few minutes alone with one and learns that a Scarran Dreadnaught is on its way to the planet. It’ll arrive in six hours. We get a ridiculously awesome sequence of Aeryn, Crichton, and Crais fighting their way past a couple dozen entrenched Charrids Our heroes are pinned down between two forces before Talyn brings the close air support. He ignores orders and flies out in front of a solar flare to do so, unfortunately, frying his sensors and half of his other systems. Effectively, he just hit himself with another immobilizer pulse. All of the damage he’s healed since the first encounter with the retrieval squad is back. The neural feedback takes out Crais’ eyes too, so it’s just Aeryn and Crichton rolling through Furlow’s garage; and they do so with fantastic gusto. Crichton is, at this point in time, right up there with Aeryn in combat capability. She’s on point, but he’s right behind her covering her back and watching her blind spots. They make a fantastic team. Furlow remains as duplicitous as the last time we saw her. She really does have the expertise necessary (or one of her techs did) to recreate Crichton’s module and design a phase stabilizer necessary to surf properly. She lied about how frequently the solar flares occurred to keep Crichton away long enough to do so. She intended to sell the technology to the highest bidder, likely the Peacekeepers, until the Charrids betrayed her and called in the Scarrans. Her highest priority remains selling the technology, not keeping it out of the wrong hands. Well… okay, her highest priority is survival, but selling the wormhole device and retiring on the proceeds is a very close second. Unfortunately, selling the data to the Scarrans becomes a non-issue after they hoover her computer. The Dreadnaught now has enough of the wormhole information to build their own device; and from there, to drop ships with twice the firepower of a Peacekeeper Command Carrier into low orbit over the homes of their enemies, exterminate them, and be gone before anyone even knew they were there. To deposit warriors largely impervious to pulse weapons directly into enemy cities. Or skip all that and just throw bombs into the engine rooms of enemy ships. With wormhole devices, the Scarrans would become unstoppable. And now they have them. Jack seems concerned, but confident that he can destroy the Dreadnaught by modifying Furlow’s phase stabilizer. He acknowledges that it’s something the Ancients would never permit, that just creating the device is tantamount to an instant death sentence. Harvey convinces Crichton not to reveal him to Jack, implying that Jack might do something terrible to Aeryn if he found out. Crichton revisits the decision later in the episode after Jack reveals that he can unlock the wormhole knowledge he’s had since their last encounter. Neither is prepared to do that with Harvey active in Crichton’s brain, and John is really tired of sharing brain space with Scorpius’ ride-along leftovers. Jack infuses Crichton with his mental energy, which leads to one of the more awesome mind battles I’ve seen. No swords, guns, fists, nor even dumpsters. This is a roller coaster ride. Everyone can relate to the sensation of a roller coaster. The violent shaking, the hills and valleys, the heavy restraints. It gives a relatable feeling of what it’s like to evict part of your brain. The episode ends with multiple cliffhangers: Crichton is back in the Scorpius suit with Aeryn’s pulse pistol against his forehead, Jack is down and unconscious, Rygel’s been hit by shrapnel, Crais and Talyn are blind and wounded, and a new Charrid force is advancing on the hangar. Crichton is teaching Aeryn English. Not just microbe-translated English, she’s learning how to speak it. Understanding is easy, but speaking to someone who doesn’t have translator microbes will be handy when she goes to Earth. This leads to a brief conversation about Aeryn and Earth, Crichton’s plans to take Aeryn home with him and whether she would go. They put the conversation off until later. Rygel mans one of the turrets defending the hangar against the Charrids. It’s a great moment for him, switching from his usual diplomat/backstabber mode to triumphant warrior. We finally get some nice flyby shots of Talyn. Not action shots or stationary, but stock flybys like we have of Moya. He’s a really beautiful ship. I love Crichton’s pulse rifle. Big shooty gun thing make boom ahahahahaha. So just when I decide that there’s a pattern to these episodes, this one comes along and throws the rules out the window. I fully welcome it, considering the episode we get as a result is amazing. This episode dives headfirst into issues with the Talyn crew that we really haven’t been considering on their half for a while. We get reminded that T’John is still very much interested in unlocking the secrets of wormhole technology, and while he hasn’t gotten as obsessive over it as M’John, he still wants to find a way home. We also get reminded that yes, Harvey is still present in T’John’s brain also. It was a little easy to forget, what with the Moya crew’s episodes getting all the Scorpius focus. I love how much of a callback this is to the first season. We get to go back to a planet we’ve seen before (although while the scenery looks familiar, the planet’s inhabitants have up and left, so it’s not quite as we remember it), and get to deal with characters and plot threads that have been hanging out since then. It’s a little interesting to note that the last time we were here, Crais was the Big Bad, and actually made one of his very rare “appearances” (albeit in hologram form, which only kind of counts). Now, of course, he’s part of the team, although his contributions on the planet itself are short lived as he has to retreat back to Talyn after the ship’s actions blind him. I absolutely love Furlow. Her bulky steampunk-ish engineer outfit, her vocal patterns, the way she wields an oversized wrench as a weapon, it’s all really fun. She’s rides that moral gray line to the extreme. She’s not really a bad person, all things considered, but money is what talks to her, not morals. She creates technology that could be used to devastating effect, and who it winds up with and how they use it isn’t really a concern of hers. The only thing she cares about is the amount she can sell it for. It’s not until she realizes exactly what Jack is that she backs down and is willing to think about something other than profit, but even then she’s scheming about how she can come out of this ahead. Speaking of Jack, we actually get to explore his character in a meaningful way this episode. The last time we saw him, we didn’t really see “him” for very long at all, and at that point he was just “generic ancient wise alien”. Now he’s actually interacting with the crew as himself (but still in a Crichton’s Dad suit) from the start, and we get a little more insight. The ancients themselves are a race that is desperate to survive, and Jack embodies that in full, totally dropping the moral superiority about the knowledge and usage of Wormhole Technology when things take a turn for the worse. Not only does he want to turn the phase stabilizer into a weapon, but he’s willing to hand over the wormhole knowledge in full to John in order to do it, both things he admits his peers would find completely abhorrent. While the situation is extremely dire, it is actually a bit of a jump in perspective, as he goes quickly from the idea of it being vital that the technology is never weaponized to one of the ends justifying the means. Harvey’s panicked insistence that John is being used by him may be a bluff, and yet Harvey/Scorpius has never really lied to John in the past. Couple that with the terrified look in Furlows eyes when she realizes just who Jack is, and it’s entirely possible that he may not be as benevolent as he appears on the surface. At the very least, it’s a distinct possibility that once the danger has passed, he may quickly pick up the “nobody must know how to use this” idea again and make sure the two people present who know too much aren’t around anymore to make use of it. The Scarrans getting a hold of information in Furlow’s computer is huge, though. This is the eventuality that Scorpius was so terrified of, the reason he deemed it necessary to implant the chip into John’s brain. And now the Scarrans have basically been handed the answer the Peacekeepers have been working so frantically to obtain. To be entirely fair to Jack, things really are totally frelled if that Dreadnought makes it out of there with that information, and even then that’s assuming that it doesn’t have the means to send that data elsewhere. It’s interesting that Harvey appears to have come full circle from the beginning of the season. He was by all appearances totally powerless as far as any control over John went, but at this point he’s either regained the ability to take direct control (arguably he couldn’t have without Jack’s “help”, though), or he had it all along still but wasn’t showing it, or perhaps the situation just wasn’t right. We get John back in the Scorpy make-up, and Harvey is back in the driver’s seat once again. It’s interesting, because I honestly have no idea where they’re going to go with this. John may still be in there, of course, and he might regain control next episode, but the existence of M’John means that they could go all the way with this, and Harvey may not be bluffing when he tells Aeryn that John is totally gone now. On a final note, Rygel gets to be awesome in this episode again, and I love him for it. He’s thrown face to face with his race’s arch nemesis, and he calmly and gleefully takes out his revenge in his interrogation with the captive Charrid. It’s interesting watching the Charrid go from smug and cocky to absolutely terrified as he realizes the situation he’s in. While Rygel does kill their prisoner, he doesn’t let it go to waste, getting vital information out of him before he dies. It’s followed up by Aeryn forcing him into manning a cannon to hold off the rest of the Charrids, which he does, reluctantly at first, but rapidly takes to it, proving that he can be a heroic Dominar of action when the situation is right. And then he gets impaled through the stomach. I’ll react when he isn’t fixed in the second part of the episode. I can honestly say that I think this is the first time where wormholes have been the A-plot of the show. Sure, don’t get me wrong, it’s been about wormholes from the very beginning, and they’ve always been in the background. Sometimes they’ve even been deceptively in the foreground – almost to the point of beating us over the head with it – but even then, they’re simply the vehicle for which the real plot of the episode is delivered. Not so this time; we’re finally brought to the point in Farscape where wormholes are the plot. We’ve actually needed almost three entire years of foundation to get here. It’s been layered in from the beginning, and only now do we appreciate the full scope of the circuitous storytelling, and discover what we’ve learned. Or at least, they’re extremely dangerous, and almost nobody should have this knowledge. The Peacekeepers want to use it to end the war with the Scarrans. The Scarrans want it to conquer the frelling galaxy. Furlow wants it to set herself up on a nice vacation planet somewhere in the vicinity of Betelgeuse. Hell, she’s honestly considering selling it to the Nebari, almost as an offhand comment. A moment to let that sink in. The Nebari. With wormholes. With all the talk of dangerous knowledge and why it shouldn’t be bandied about, it’s actually Rygel who spells it out cleanly for us why it’s so dangerous. Imagine you have a fortified solar system, with fleets of warships, millions of weapons, and scores of perimiter defenses. Now imagine one ship popping in at a low orbit above your seat of command, dropping one bomb, and skedaddling before anyone knows they’re there. Now imagine an entire fleet doing this. To multiple systems. Simultaneously. The Ancients go on and on about how Crichton (and by extension, Earth) isn’t “ready” for this information. They’re absolutely right, because all it takes is one person with warlike tendencies to realize how much better the galaxy would be without all those pesky people in it. Of course, that’s simply using the wormholes for travel. According to Not-The-Father, there’s a way to convert it into a weapon. Season Three: It Gets Worse. I completely forgot about this two-parter, but I’m loving the hell out of it. We’ve spent so much time worrying about what would happen if the Peacekeepers gained access to wormhole technology that we forgot about the backdoor continuity thread of Furlow and the threat of what would happen if Scarrans got their hands on the secrets. Though her shtick is starting to grate on me a bit, it’s great having Furlow back on the scene, flirting with John and smashing things with her oversized wrench. I’ve never really been all that impressed with the actor playing John’s dad, Jack. There’s always been a bit of stiffness, but it sells wonderfully here as the alien taking his form is no longer trying to hide his identity, and there’s a calmness to his actions and a depth to his gaze that truly gives life to the term Ancient. Like the others, I’m intrigued to see where his intentions ultimately lie. Will he let our heroes leave with the secrets he’s revealing, or will they be terminated once they serve their purpose? Yay faulty memory for letting it be a surprise once again! For all of the horror stories Rygel tells about the fearsome Charrid, they seem awfully inefective. Sure, they have overwhelming numbers, but look at how they completely fail to hit any of our heroes while an entire army’s worth of their number is picked off. It’s frelling Cobra! That’s about my only issue with the plot. It’s a good story that digs up some faces from the past and uses them to drive forward the main plot in an epic, unexpected way. The bits with the half-blind Stark leading the blind Crais are hysterical. Rygel gets his hero moment at the turret. And Harvey. Oh, Harvey! 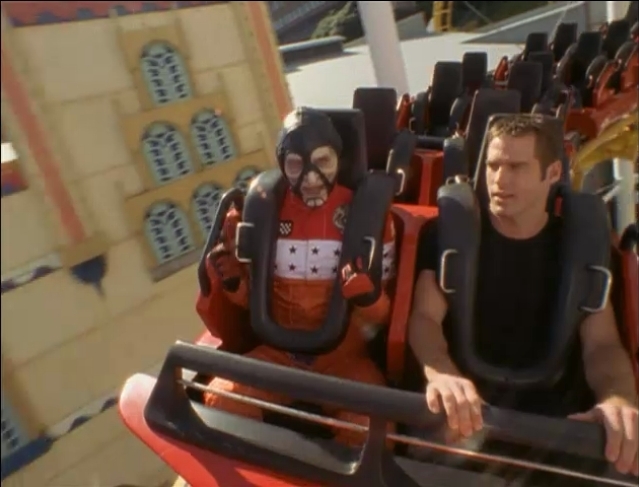 Going from jokey scenes in a bumper car to one hell of a wicked cliffhanger twist. I love it.